While exploring an uncharted region of space, the U.S.S. Enterprise comes upon an alien space buoy which is cube-shaped and spins, warning ships away and blocking the starship's path. Kirk's orders the phasers to destroy the buoy but immediately an alien's ship, the I.S.S. Fesarius, shaped like a large, glowing crystal traps the starship. A ghostly, almost skeletal face appears on the viewscreen, identifying itself as Balok. He tells Kirk that the U.S.S. Enterprise has trespassed and committed hostile actions, and therefore, must be destroyed. 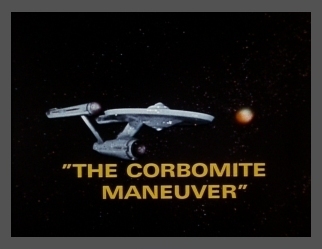 Employing a trick from the Earth game of poker, Kirk tries a desperate bluff by convincing Balok that if the Enterprise is fired upon, the corbomite in the starship's hull will self-destruct and destroy both ships. Believing Kirk, the Fesarius instead takes the starship in tow, but Kirk wrenches his ship away so suddenly and with such force that Balok's ship is apparently disabled. When the Fesarius transmits a distress call, Kirk, McCoy and Lieutenant David Bailey, still nervous about the bluff played against the powerful alien, beam aboard the Fesarius. They find that the Fesarius is manned by only one entity, a friendly, child-like being who projects the 'Balok' image to potential enemies, knowing his own stature would be far less daunting. They also find that Balok's ship has not been damaged, but that the alien was merely testing the U.S.S. Enterprise crew to see if they were as peaceful as they claimed to be. A kind of diplomatic relationship is formed over drinks of tranya, and Lt. Bailey offers to remain with Balok as a sort of exchange student to learn the alien's ways and teach him about the Federation. That's our captain, always thinking of his ship first! That's one of the reasons he's the best in the fleet! She says it a LOT in this episode!